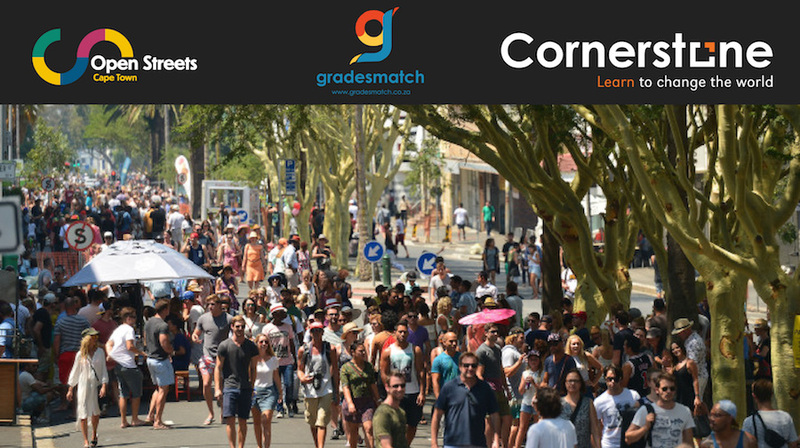 Cornerstone Institute, in partnership with Gradesmatch, will be participating in Open Streets, Cape Town on Sunday, 27 January 2019. This event, which regularly takes place in various locations across Cape Town, will this time around attract Capetonians and visitors alike to Bree Street between 09h00 and 14h00. Come and visit our stand on the corner of Bree and Orphan Streets. Open Streets aims to create shared spaces that help bridge the social and spatial divides in Cape Town and encourage us all to think differently about how we move around the city. Cornerstone Institute is a non-profit, fully accredited private higher education institution. We provide higher education inclusive of degrees, certificates and short courses. We have programmes in the disciplines of Business, Media, Education, Theology, Psychology, Sociology and Community Development. Gradesmatch is a comprehensive career guidance technology that assists learners in Africa with career planning to unlock their potential. The technology is designed to map career data to learners, teachers and mentors, assisting in making well-informed good career decisions to improve long-term education and career outcomes. Cornerstone will be offering free career guidance and study advice and will introduce all visitors to the excellent work that Gradesmatch is doing in this regards. For more information please see: https://cornerstone.ac.za, visit our campus at 4th Floor, 2 Roggebaai Square, Foreshore, Cape Town or call 021 448 0050. A citizen-driven initiative working to change how we use, perceive and experience streets.